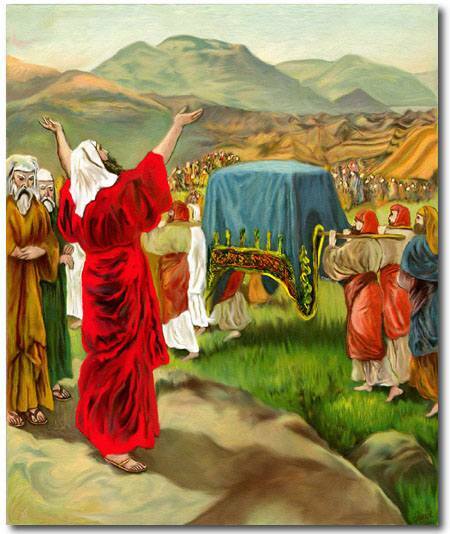 Story of the Journey to Canaan with free images and lessons, free to use. NUM. 10: 29-36. "Come thou with us, and we will do thee good; for the Lord hath spoken good concerning Israel." God's people were travelling to the Promised Land. A pillar of cloud led them. The ark, with its blue covering always went before them, as the picture shows you. When the ark started Moses prayed, and also when it stopped. Moses invited a man named Hobab to go with the people. "Come thou with us, and we will do thee good," he said. Where did God's people wander forty years? With what was it covered? What did Moses do when it started? What did he say when it stopped? What did Moses say to Hobab? To what place are you going? What could you say to others?